Jihad Terror: ISIS affiliated Muslim terrorists killed over 120 people and wounded many more in savage attacks across central Paris in November. 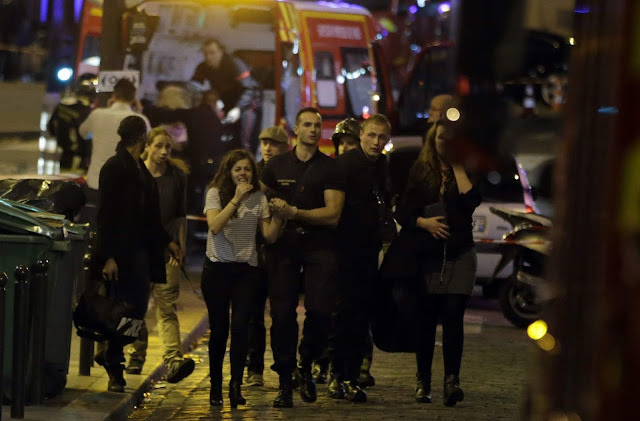 French President, Francoise Hollande, declared a state of emergency and vowed to “annihilate” those responsible. Subsequently, massive raids were conducted by police throughout France, leading to multiple arrests and at least one armed stand-off with Jihadis, in which several terrorists were shot. French air and naval assets have been deployed in the ongoing fight against ISIS in Syria and Iraq. Forward in Christ urges your prayers on behalf of the victims of Islamic terror around the world and for the conversion of Muslims to faith in Christ. CofE Bishop Prays to a New God: Rachel Treweek, the new bishop figure of the Diocese of Gloucester, told the U.K.’s Guardian that she no longer prays to God as “he,” although she sometimes forgets. Christians believe that God has revealed himself in masculine terms and, in Christ, as a man. We have to ask, what deity is Treweek praying to? TEC Tanks, ACNA Grows: According to the latest figures, the Episcopal Church (TEC) continues its long decline. From 2010-2014, the small but wealthy denomination lost 241 churches, 189,000 members, and 82,000 persons in average Sunday attendance. In contrast, The Anglican Church in North America (ACNA) grew by 248 churches over the same period and gained 10,000 new members. Average Sunday attendance grew modestly, from 69,197 in 2009, to 71,664 in 2014, making it comparable to the Anglican Church of Canada. Episcopal Dean Blesses Abortion Clinic: A group of clergypersons blessed a Cleveland abortion clinic in October, on the initiative of a Methodist minister, Laura Young. The blessing was carried out by the lesbian Dean of Cleveland’s Episcopal Cathedral, Tracy Lind. What part of doing God’s work does selling baby parts to biotech firms fall under, and for that matter, what “God” is the RCRC working for? FiFUK Transitions: At its November 2015 National Assembly, at the Church of St Alban the Martyr, Holborn, Forward in Faith UK completed an important transition. The organization’s primary role in future will be as a support structure for The Society of S. Wilfrid and S. Hilda. Forward in Christ wishes FiFUK well in its new role. Primates Meeting: Conservative GAFCON primates, representing the great majority of the Anglican Communion, have agreed to attend a Primates meeting, called by the Archbishop of Canterbury, in January. ACNA Archbishop, Foley Beach, has been invited, as has the Episcopal Church (TEC) and the Anglican Church of Canada. (ACoC).